Pappardelle with Bolognese Sauce is one of my favorite pasta dishes. The sauce is thick and hearty with lots of meat, both pork and beef, and tons of flavor from white wine and some onion, carrot, and celery. Pure comfort food on a cold winter night. Simmered slowly with white wine and milk, the meat gets super tender. In fact, the meat and liquid ingredients just kind of unify into one, creating a super thick and flavorful sauce. 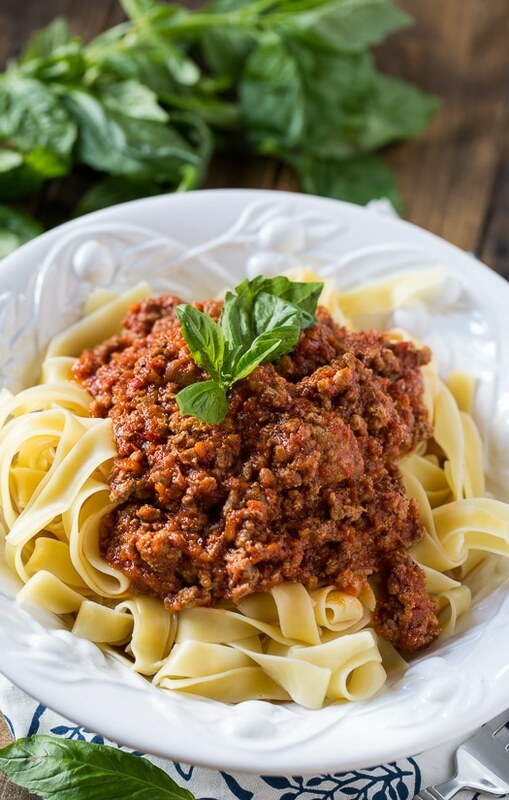 Typically, red wine would be used in a Bolognese Sauce and I’m sure this sauce would taste just as good, and probably even more robust if you used red wine. 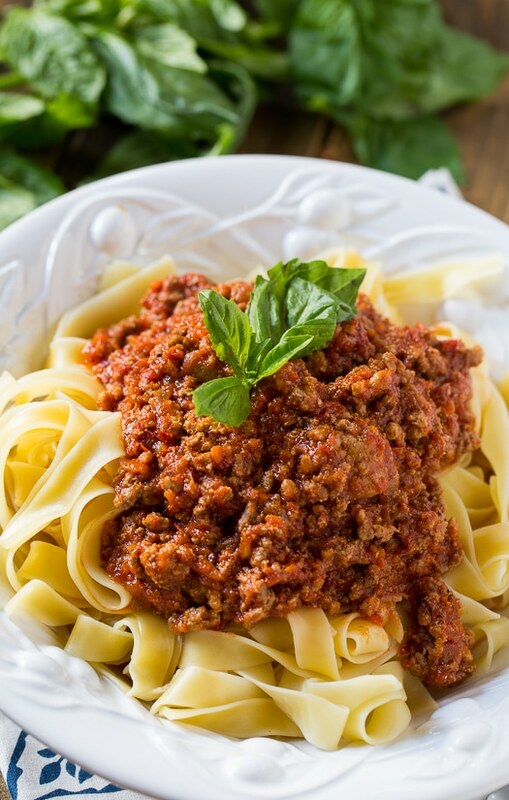 Pappardelle is the perfect pasta to pair with this Bolognese Sauce. It is substantial enough to stand up to a rich, thick sauce. Even though I’ve checked at least 10 times, I feel certain I spelled pappardelle wrong at least once. It’s making me feel like I have OCD! I wish pasta names weren’t so hard to spell. This recipe serves four, but you will have leftover sauce. It freezes very well. Pappardelle with Bolognese Sauce is a rich and hearty pasta meal. The sauce is made with both pork and beef and flavored with wine. Place onion, carrot, and celery in a food processor and pulse until in small pieces. Set aside. Heat a large saucepan over medium-high heat. Add olive oil and onion, carrot, celery mixture. Saute for 3 minutes. Mix in wine and continue to cook until wine reduces by half. Reduce heat to simmer and add tomato paste. Stir in completely. Add tomato puree, sugar, and water and mix well. Cover and simmer over low heat for 1 hour. Stir often. Add more water if sauce gets too thick. Cook pasta according to package directions. Pour into a large serving bowl, mix in sauce, top with grated parmesan and basil. This entry was posted in Dinner and tagged beef, pasta, Pork. Bookmark the permalink. I made this substituted ground chicken for beef and used hot Italian sausages, used anchovies and some of the anchovy oil and red wine. It was amazing! Definitely craving a massive bowlful of this pappardelle bolognese right now. It looks BEYOND delicious! 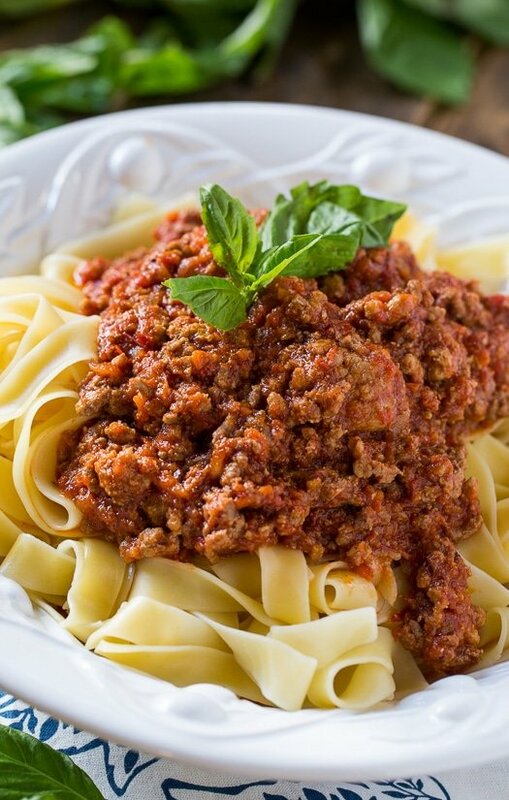 Oh god I am just drooling here over your delicious images of this bolognese. Totally craving a bowlful to devour right now, pinned! 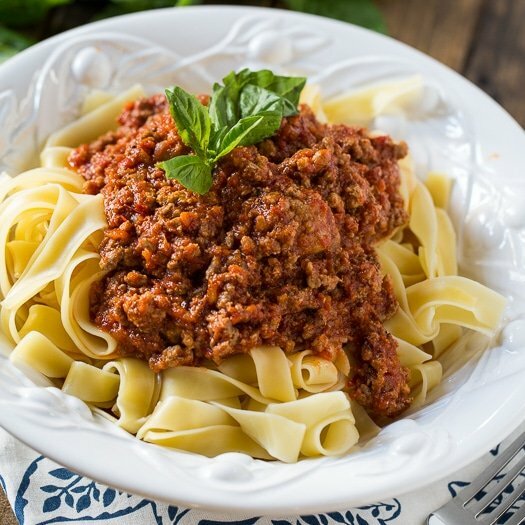 I’ve never actually made a traditional Bolognese sauce — this looks perfect! And I bet the addition of milk in the sauce adds some amazing depth! 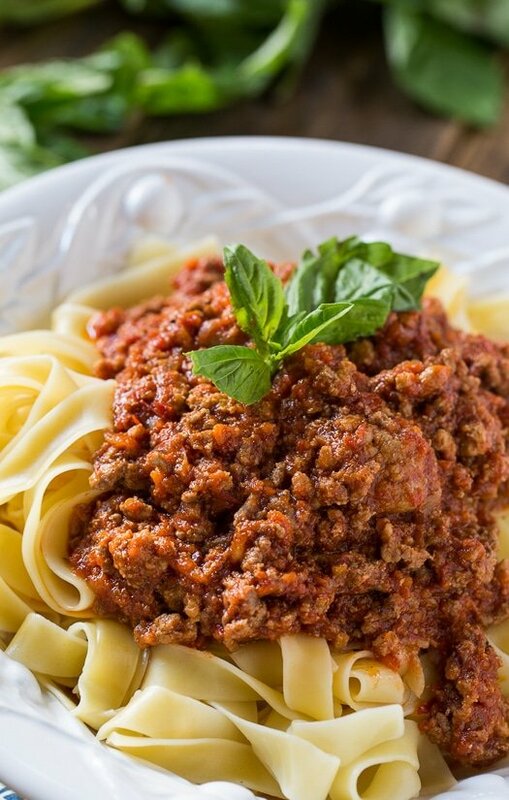 Bolognese sauce if one of my favorite tomato based sauces. I also love using the leftover sauce over baked potatoes, so yummy. Your recipe sounds so good, I’m thinking of making some soon. 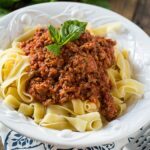 Mmmm pasta bolognese is one of my favorite winter pasta dishes, and yours looks so hearty and comforting! Love it! *Drool, drool, drool* This looks so yummy! It’s perfect comfort food. This looks like the perfect comfort food to enjoy on a cold winter night!